What's in an apology? Some expressions of remorse are commonplace  we hear them on the playground when kids smack each other on the head, or they land in your inbox after a friend forgets your birthday. It's the grand-scale apologies, it seems, that are harder to come by. 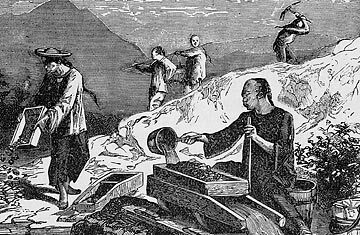 On July 17, the California legislature quietly approved a landmark bill to apologize to the state's Chinese-American community for racist laws enacted as far back as the mid19th century Gold Rush, which attracted about 25,000 Chinese from 1849 to 1852. The laws, some of which were not repealed until the 1940s, barred Chinese from owning land or property, marrying whites, working in the public sector and testifying against whites in court. The new bill also recognizes the contributions Chinese immigrants have made to the state, particularly their work on the Transcontinental Railroad. The apology is the latest in a wave of official acts of remorse around the globe. In 2006, Canadian Prime Minister Stephen Harper made a similar apology, expressing regret to Chinese Canadians for unequal taxes imposed on them in the late 19th century. Last February, Australian Prime Minister Kevin Rudd apologized to his country's Aborigines for racist laws of the past, including the forced separation of children from their parents. Five months later, the U.S. Congress formally apologized to black Americans for slavery and the later Jim Crow laws, which were not repealed until the 1960s. And most notably, in 1988 the U.S. government decided to pay $20,000 to each of the surviving 120,000 Japanese Americans imprisoned in camps during World War II. Says Donald Tamaki, a San Franciscobased attorney who helped overturn wrongful WWII-era convictions of Japanese Americans: "Part of what a humane society does is recognize past injustices and address them." The California resolution moved quickly through the state legislature since it was first introduced in February. "It's symbolic to recognize that the state made mistakes," says assembly member Paul Fong, who co-sponsored the legislation with assembly member Kevin de Leon. "These laws reverberate to this date because racism still exists." Most of the direct victims of the laws in question have already passed away. Fong's grandfather was held for two months at Angel Island, an immigration station near San Francisco that targeted and detained several hundred thousand Chinese immigrants from 1910 to 1940. Dale Ching, 88, arrived at Angel Island from China's Guangdong province in 1937 at age 16. Though his father was an American citizen, immigration authorities detained Ching for 3½ months. "My intent was to try to have a better life, better than in China," says Ching. "But at that time, they didn't want you to get ahead." How times have changed. In the throes of huge budget cuts, California is wooing cash-flush mainland Chinese tourists to its sun-kissed coastline and world-famous theme parks. So far this year, the state's Travel and Tourism Commission has opened offices in three Chinese cities. In 2005, Governor Arnold Schwarzenegger toured China on a six-day trade mission to peddle his state's produce, technology and raw materials. China is now California's fourth largest export market, after Mexico, Canada and Japan. In 2008 California exported $10.9 billion worth of goods to China, up 40% since 2005. With the California bill in the bag, Fong now plans to take the issue to Congress, where he will request an apology for the Chinese Exclusion Act, the only federal law ever enacted to deny immigration based exclusively on race or nationality. Passed in 1882, the law was not fully repealed until 1943, after China and the U.S. became allies in WWII. Given President Obama's decision to appoint Gary Locke as Commerce Secretary and Steven Chu as Energy Secretary, Fong says he's confident of the bill's passage. "As a person of color, President Obama would understand these issues," he says. Fong does not plan to press for financial compensation for the surviving victims of the state and federal laws in question, despite the Japanese-American precedent. More important than individual compensation, he says, is to help educate younger generations about the mistakes of the past. That said, Fong may ask for funding to help preserve the Angel Island immigration station, dilapidated after decades of neglect. To complicate matters, the station is located within a state park that, along with several others, may be shut down to help balance California's budget shortfall. Not long after his father helped negotiate his release, Dale Ching joined the U.S. Army and fought Japanese forces during WWII. He went on to become an electronics technician, but after retiring, he began volunteering as a docent at Angel Island in hopes of drawing more attention to that moment in history. "We've been fighting, but nobody would listen," he says. "Finally someone has said sorry."